Take a look at these two wiring diagrams. One is of a trigorilla board and the other is the duetwifi board. I will be adding the duet wifi and paneldue with 5inch LCD touchscreen to an anycubic kossel delta printer when duet wifi and panel due arrive in the mail.. Reason for upgrade because the old trigorilla board has had a D.C. Power failure and they aren't making it anymore so I cannot simply switch them out. The trigorilla board is almost salvageable since I can get it to run on usb power but it won't run stepper motors and extruder thermistor for instance. And I mean I'd have to change out parts on the board itself and if I'm lucky get it back running. However in two weeks I'll be featuring this printer in an advanced art collage class and unfortunately I don't have time to mess with it in hopes to get it back up. So I'm trading my unlucky situation for a learning experience with duet wifi. And looking at shipment times it seems I'll have to get this up and running within about a week. So I am wondering for now, am I right about the duetwifi board not needing the 12v power supply connected the same way for the heated bed? The trigorilla board had the 11A terminals for heated bed coming from power supply and then sent boards adjusted power to heatbed with another set of terminals to heated bed I believe. Looking at this duetwifi board looks like I would hook my 12v power supply up to its power terminals (powering up everything with one set of terminals) and just simply plug my heated bed into the 18A terminals? Another question is it seems my heated bed performed better getting to 100 degrees for ABS when I turned my adjustment screw on the power supply all the way up. And I mean that was the only way it would reach 100 degrees otherwise it would stop at around 75 degrees. Ok so since the power supply would also be powering up everything else would the adjustment on power supply damage anything like the wifi duet board? I'd hate to have another paper weight. Thanks everyone! I will have more questions I'm sure. Turning the power supply up is fine, so long as it does not go above 24V which I doubt will happen with that supply. I have a 24V supply that is similar and I get about +/-4V from the center. Be aware that by turning the supply up, your heater cartridge on the hotend and fans will also be running at a higher voltage. Standard 12V cartridges, esp the 40W will be able to get even hotter at 15V. While you are waiting for delivery it's worth.making yourself familiar with the configuration (see the wiki, esp setting up a delta printer and the gcodes page). I have been reading the wiki for a bit. My initial desire was to use an old kindle fire for display but since I'm taking this away from my house I thought I'd use the paneldue which has the SD card option I think so I can just add gcode files to print on the fly in case the web interface can't be used due to their wifi setup. Also it's nice to have a dedicated LCD for it anyways. I think the only thing I may not have time for is making mounts for all of this. I'll do a temporary mount on wood to get by. I think the only slow down for me would be the anycubic came preprogrammed with rod length and extruder type for example. This time I'll have to input it all I believe. I don't have an autobed level so it will all be manual calibration. In firmware 1.19 the auto calibration in the Duet firmware can be used without a Z probe, but you need to use the web interface for that because PanelDue firmware doesn't yet have the necessary support. You set up auto calibration as normal (see https://duet3d.com/wiki/Calibrating_a_delta_printer) but use P0 in the M558 command in config.g to say that you have no Z probe. At each probe point, the web interface will present some buttons for you to jog the nozzle down until it just touches the bed, then you press OK.
Is this the link you wanted me to see. That link was broken. And it looks like if I really wanted to I could use this wizard. I did not realize that the web interface could do that though. It would speed things up for sure. That's a bummer about the PanelDue not being able to. I mean one day i'll add the auto z probe, but sounds like an important update to have just incase something happens to the zprobe and you aren't around your wifi for calibration. Before on my old setup I would use something like pronterface and have it stop right before the bed and click it down myself then have to remember the amount it needed in difference. Then go back to the arduino configuration.h file and make the change. Back and forth back and forth. So that helps a lot. You know I had also added bed level screws and springs so I could help it quicker manually a long time ago. I guess those may still be useful. On a fresh install I always had to keep in mind mostly in their arduino software configuration.h file they called it Delta_Diagonal_Rod to change it for (Size of model vs it's size in model. You know for example your 10mmx10mmx10mm box comes out an actual 10mmx10mmx10mm box) to get it to be equal and the Delta_Smooth_Rod_Offset(concave vs convex) so that your outer most print height is the same as your center print height. I am not sure how that relates to the DuetWifi board yet. So your saying it will figure all that out with concave and convex? Well I see that all my changes will be easy and quicker to make with the web interface and the paneldue. Even if I have to pull that micro sd card out and load it into my computer or use an USB cord and make changes it still seems faster than before…. Is it possible to use the web interface without wifi or internet? Like connecting it to printer directly and pulling up that page? That way if I don't have wifi connection so I would still be able to autocalibrate it without having a zprobe. Yes that's the page, I put the closing bracket in the wrong place when composing the message. I will update PanelDue firmware to support manual probing soon. If your delta geometry is accurate, you should just be able to put the measured diagonal rod length into the configuration command. If necessary, small adjustments to the scaling can be done using the M579 command, see https://duet3d.com/wiki/G-code#M579:_Scale_Cartesian_axes. You don't need to pull the SD card out because you can edit the configuration files in the web interface. You don't need an Internet connection to use the WiFi interface, but currently you to need to establish connections from both the Duet WiFi and your PC/tablet/smartphone to a wireless access point. I am thinking ahead when I am at that college and need to make a change or adjustment. Hopefully It will not be needed. Moving the printer might make it change somehow. They are supposed to have wifi and maybe this will be beside the point but just in case I don't have the opportunity for wifi use and i'd have to somehow adjust the settings. I would hope I could change it with no wifi. I do appreciate your time. On a slightly related note. If I do not have a wifi connection. I'm starting to think I can use my phone as a hotspot and put my laptop and 3d printer on my phones wifi because they would be on the same wifi connection it may work. I could actually be anywhere and use my laptop to edit the files the same way without additional wires. Makes me think though of wifi direct or bluetooth connections on duet now. That way my cell could connect to printer directly and maybe it would use an app on the phone to make changes eliminating the use for a laptop. Well removing all the setup processes for a new wifi connection. I know I can use my cell now using a browser and wifi connection but I was thinking in terms of using my cell and being away from both a laptop and wifi routers. I am sure one day you guys will add all the bells and whistles. You would have to get into app development for both apple and andriod. For now I think I will love what I got. It's an upgrade for sure like it is.. Yes you can use your smartphone as a hotspot to connect your PC and Duet together. I hope to get the Duet working in access point mode eventually. I'll keep researching just thought this would speed me up asking. Looks like the only other thing is the end stops I have are two wires red and black and your board has three wire input gray yellow and black. Would Black be Black and Red be Yellow? I am not sure what the gray would be for if so. Unless it's (black and black) and (red and gray) I should use? I see that black is ground and gray is I/O and Yellow is 3.3 volts.. I am not sure why it's throwing me off at the moment between gray and yellow though..
Everything else would just be me changing out most of the connectors to work on the board I think. I found this picture would you agree with the comparison? 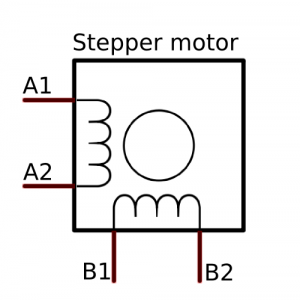 I really do not want to mess up the stepper motors I have. 1. With the stepper motor not connected to anything, spin the shaft with your fingers to see how easy it is to turn. Now short 2 wires together and try to spin the shaft again. If it is much harder to spin, those 2 wires are one phase, and the other 2 wires are the other phase. Typically red and blue are one phase, and green and black are the other. 2. Connect the wires of one phase to the 2 pins at one end of the 4-pin Duet motor connector , and the wires of the other phase to the 2 pins at the other end. Any thoughts on the end stops wiring? Positive (RED) to your board YELLOW 3.3 Volts? Negative (Black) to your board (Black) ground? If the endstop switches have only 2 wires, they are simple microswitches, and the wires should be connected to the two outer pins of the 3-pin connector - it doesn't matter which way round. Thanks again, Gotcha so on your board outer pins Black (GND) and Gray (I/O) then? Yes, leaving the 3V3 pin unconnected. I was using https://configurator.reprapfirmware.org/ and the z-probe code in config.g file isn't there anymore?? Also not sure what Firmware compatibility: should be used. Maybe I need to reinstall factory and edit manually? It was telling me not to use the file it was for testing only and to come to the above URL. Sorry I missed this thread until now. I just upgraded my Anycubic Kossel to Duet electronics a few weeks ago. I also moved to the smart effector/magball/E3D hotend–sounds like you're still using the Anycubic effector? If so, I really recommend replacing the 40mm radial part cooling fan with a 50x15mm radial. Adapters are on thingiverse. Stepper wire pairs are colored just as dc42 describes. red/blue and green/black. The 20A power supply Anycubic provided with my kit was insufficient, and I had to move to a 30A meanwell. Seems you're set there. With the higher print speed that the duet allows, the Anycubic extruder is not strong enough, I find. Trying out different variations on geared extruders, Much improvement, but haven't found a solution I'm entirely happy with. Hi. I did the same. Changed from Trigorilla to Duet Wifi one week ago. Actually i am struggling to get the right settings. Thanks Gone2Far do you have some links for smart effector/magball/E3D hotend and whatever else you have come up with? My extruder motor type is the same as the XYZ steppers. I was thinking the extruder was a little over sized on the motor. Although they did package different stuff as the years went by on this anycubic so you might have had a different one on your extruder? Yeah I feel the same ROT I'd like to know more about the motor settings too. So far I know mine is 1.8 degree and it's a 1500ma motor but I am not sure about microstepping settings. I see that 256 is really quiet but x8 256 interpolated is noisier for example. Looks like you can choose calculate steps per mm if you know your microstepping then you need to know your belt type, tooth pitch and pully teeth count. Mine is set at GT2 2mm belt, 2mm pitch and pully is 20 tooth. I think thats right for this delta. Microstepping, Max. instantaneous speed change, Maximum speed, and Acceleration I need to know. What I am focused on at the moment is when I do the manual calibration and the screen pops up on the web interface to jog down. It doesn't jog down but sideways. It homes ok, and when I hit the buttons to move the thing around on normal control screen it does what I want it to. The menu from auto calibration is asking me about x jogging down rather than Z. So I have no idea the only other thing I can think of is my towers are in a different order in the software vs the actual. Mine are XYZ going counter clock wise. What do you guys got yours doing?